The USS RICHMOND K. TURNER (CG-20), the fifth Leahy class cruiser, was commissioned on 13 JUN 1964 as guided missile destroyer leader DLG-20. Built at the New York Shipbuilding yard in Camden, New Jersey, USS RICHMOND K. TURNER was called to Vietnam after her shake down training a Guantanamo Bay, Cuba. RICHMOND K. TURNER deployed four times to the waters of Vietnam, then underwent an extensive overhaul in Bath, Maine during 1971-72. USS RICHMOND K. TURNER assumed duty in the Atlantic after overhaul and sailed on Caribbean, North and south Atlantic, Mediterranean and Indian Ocean deployments for the remainder of her service career. 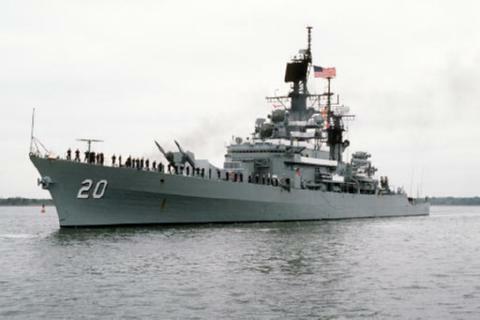 USS RICHMOND K. TURNER served her country for 30 years and 10 months, until decommissioned on 13 APR 1995. The hulk of USS RICHMOND K. TURNER was disposed of as a target off Puerto Rico in August 1998.